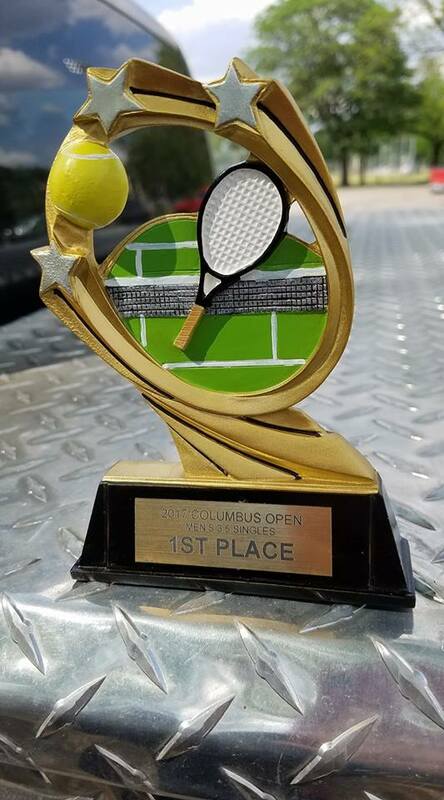 Congratulations to Ed Kirkwood on winning the 3.5 Men’s Single division of the Columbus Open Tournament June 4. Ed defeated David Clark of Lincoln 6-2, 6-1 and then David Taylor of Gretna 6-3, 6-3. Congratulations to Alex Bigsby on winning the 10-and-under Boys Singles Championship at the 2013 Cornhusker State Games held Thursday, July 25 at Lincoln. Alex played three matches in round-robin play on his way to the win, dominating in every match. He lost only two games in the three matches. Round 1 – Alex defeated Michael Endacott of Lincoln 4-0, 4-1. Round 2 – Alex defeated Caden Haar of Lincoln, 4-0, 4-0. Round 3 – Alex defeated Seth Stowell 4-0, 4-1. Congratulations to Mark Leahy and Jordan Zoucha of Fremont who teamed up in the 4.0 men’s doubles at the Centre Court-KFC-Pinnacle Bank Fremont Adult Open played June 21-23, 2013 at the Fremont Senior High Tennis Complex. They defeated Mike Gardner (Bellevue) and Ricardo Hernandez (Omaha) in the Quarterfinals 6-3, 6-3. In the semi-finals they defeated Roland Augspurger (Columbus) and Mike Willman (Fremont) 7-5, 7-6(3). In the final, they defeated John Crook and Thomas Huffman of Omaha 6-4, 6-4. Justin Bigsby played in the 4.5 Men’s Singles, losing the first round to No. 1 seed, Jerry Brocky (La Vista) 6-2, 6-2. Jordan Zoucha played in the 4.0 Men’s Singles, advancing to the Finals with winds over Michael Pivovar of Omaha 6-2, 6-2, Trevor Davis (Omaha) 6-7(8), 6-4, 1-0(7), and Ryan Kellogg who withdrew for illness. He lost a close final match to the No. 1 seed, Christian Cortinas (Omaha) 4-6, 6-3, 1-0(5). Mark Leahy also played in the 4.0 Men’s Singles, defeating Todd Hultman of Omaha, 6-0, 6-0 in the first round, then winning over Rock Hansen of Coucil Bluffs, IA in the Quarterfinals, 6-1, 6-1. Mark withdrew in the Semifinals trailing 2-6, 3-3 due to illness. Dana Mark played in the 3.5 Men’s Singles losing in round one to Sajid Kalmani (West Des Moines, IA) 3-6, 6-3, 10-7. In the consolation bracket, he defeated Jerry Pivivar (Omaha) 6-3, 6-1 before losing to Scott Hagewood (Omaha) 5-7, 6-2, 1-0(1). Ed Kirkwood won 2nd in the 3.0 men’s singles, losing to Panyot Puapanpattana of West Des Moines, IA in the final of round robin play 2-6, 6-2, 1-0(12). Wyatt Spalding was also entered and would have played Ed in the first round, but had to withdraw due to illness. Mike Willman teamed up with Roland Augspurger (Columbus) in the 4.0 Men’s Doubles. They defeated Jason Luedtke and Scott Adams of Omaha 6-4, 6-2 before losing to Leahy/Zoucha in the Semifinals 7-5, 7-6(3). Jim Johnson and Jim Jorgensen (Blair) teamed up in the Men’s 60 Doubles. In round-robin play, they defeated John Crook and Thomas Huffman (Omaha) 6-1, 6-4, and Bob Martin and George Young (Omaha) 6-0, 6-0 to take home first place. Dana and Renate Mark teamed up for the 8.0 Mixed Doubles. In round-robin format, they lost to Paul and Shannon Brinkman (Lincoln) 6-2, 6-3. They also lost to Dana Caudle (Elkhorn) and Joni Woodruff (Papillion) 6-1, 6-1. Ed Kirkwood and Dipal Patel teamed up in the 6.0 Mixed Doubles. They had one match which they lost to Jerry and Leslie Pivovar (Omaha) 6-4, 3-6, 6-4. Thanks to all who played in the Fremont Adult Open. And thank you to Diana Myers, Justin Bigsby and their helpers for a great tournament. Spalding, Willman, and Marks earn hardware at Columbus Open. Wyatt Spalding is shown sporting his trophy from the rain drenched/delayed/interrupted Columbus Summer Open Tournament June 8-9, 2013. No matches could be played outdoors on Saturday. Some were played on two indoor courts at the Columbus YMCA and one match played at the Fremont YMCA. Sunday was cool and cloudy but left-over matches from Saturday were finished and all the Sunday matches got finished. Thanks to Roland Augspurger and Curtis Goebel for hosting the tournament. Wyatt Spalding of Fremont earned 2nd place. 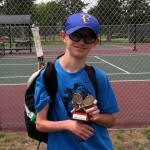 He was defeated in the final match, 6-1, 6-0 by Ronald Bender of Grand Island. Mike Willman teamed up with Roland Augspurger (Columbus) in the Men’s Open Doubles. They defeated Rich Prochaska and Max Prochaska of Ralston in round one, and Curtis Goebel (Columbus) and Thomas Huffman (Omaha) in the final round 7-6, 6-1 for the championship. Brian and Renate Mark teamed up in the 8.0 mixed doubles. They defeated Ronald Bender and Jessica Bender of Grand Island 6-0, 6-1 in the semifinals, then lost 6-4, 6-1 to Barry Dahlkoetter (Omaha) and Jan Moore (Columbus) in the final. There is some debate on how the final might have turned out if Brian had not sprained his ankle in the first match. Dana Mark played the 3.5 singles event. He defeated Michael Martin of Marquette 2-6, 7-5, 7-6 (10-7) in round robin play. In the final round, he defeated Daniel Stack of Columbus 6-2, 6-1 for the championship. Congrats to the winners from Fremont. See you at the Fremont Open! Nicholas Eker and Lexie Zoucha of Fremont teamed up to win the NTRP 8.0 mixed doubles title at the Centre Court-KFC-Pinnacle Bank Fremont Adult Open held June 22-24, 2012, at the Fremont High Tennis courts. In the final match on Sunday, Eker and Zoucha defeated Jennifer Allison of Bellevue and Tim Dunning of Omaha 3-6, 6-4, 6-1 for the title. On Saturday, they had defeated Renate Mark and Jon Rohloff, both of Fremont, 6-2, 1-6, 6-2 in the semifinals. Several other Fremont area players participated in the Fremont Open. Luke Prescott played in the Men’s Open Singles, losing to Vince VanDyke 6-1, 6-1 in round one, then losing to Justin Brinkman of Lincoln 6-1, 6-1 in the consolation semifinals. Lexie Zoucha also played in the women’s Open Singles division, losing to Hannah Higgins of Lincoln 1-6, 6-2, 6-2 in round one, then going 3-6, 6-4, 4-4 with Katherine Krueger of Omaha before withdrawing due to illness. Erica Dickmeyer teamed up with Lexie Zoucha in the 4.0 Open Doubles, losing the opening round to Elin Smith Of Mount Vernon, Ohio and Anne Yust of Alabama 6-0, 6-2. Smith and Yust ended up winning the open doubles division. Chris Westergaard entered the Men’s 4.0 singles, defeating Michael Pivovar of Omaha 6-4, 4-6, 6-4 in round one, then losing to the eventual 4.0 champion Rick Hansen of Council Bluffs, IA 6-4, 6-2. Mark Leahy and Chris Westergaard teamed up, as did Mike Willman and Mostafa Jamshidi of Lincoln, as well as Brian Mark and Jon Roholoff, for the 4.0 Men’s doubles. Mark and Chris lost to eventual 4.0 champions, Eddie Flood and H.D. Osborne of Omaha in round one 6-1, 6-4. Mike and Mostafa won round one against Jonathan Jameson of LaVista and Rodney Spence of Omaha, 6-1, 6-0, and then lost to Jonathan Holtz of Elkhorn and Brian Kounovsky of Omaha 6-7(2), 6-3, 7-5. Brian and Jon won their first round match 6-3, 7-5 against John Blackhawk and Steven Stolen, both of Sioux City, IA 6-3, 7-5, then lost to eventual champions Flood-Osborne 6-0, 6-0. Ed Kirkwood and Dana Mark played in the Men’s 3.5 singles. Ed lost to Robert McGovern of Omaha 6-3, 6-3 in round one, then to Michael Martin of Marquette, NE 6-1, 6-1 in the consolation semifinals. Dana defeated Jerry Pivovar of Omaha 6-3, 6-3 in round one, then lost to Steven Stolen of Sioux City, IA 6-0, 6-1 in the next round. In Women’s 3.5 singles, Dipal Patel lost to Joni Woodruff of Omaha 6-1, 6-0 in the only match played in that division. Joshua Sammons played in the Men’s 3.0 singles, where he dropped two matches in round robin play, to Haibo Huang of Omaha 6-1, 6-1, and Rodney Spence of Omaha 6-0, 6-4. Ed Kirkwood and Dipal Patel teamed up in the 7.0 Mixed Doubles, losing in round robin play to Jerry and Leslie Pivovar of Omaha 6-4, 6-3, and to Robert McGovern and Michelle Roberts of Omaha, 6-0, 6-2. Jay Kohout played in the Men’s 55 singles. He was defeated by Rick Huetson of Omaha 6-1, 6-1, and by David Irons of Clive, Iowa 6-3, 6-0. Thanks to all the participants, and to Diana Myers and Justin Bigsby for their leadership in running another great tournament, and to Sarah Bigsby, Amy Ahrens and Mike Willman for their help in the directors booth, as well as any others who helped in any way. And a big thanks to our sponsors, Centre Court, KFC, and Pinnacle Bank. Mark Leahy won the Men’s 45 Singles event at the Kubat Pharmacy Omaha Adult Open held at Koch Tennis Center My 25-28. In round-robin play, he defeated Skip Rice 6-1, 6-1, and Brad Miller 7-5, 6-1. Mark also teamed up with Chris Westergaard to win the Men’s 4.0 doubles. They defeated Robert Harris and Paul Morrison 6-1, 6-3, Dan Hrivnak and Thomas Walker 6-7(3), 6-3, 6-1, and the No. 1 seeds, William Stephens and Clark Thompson 7-6(5), 6-3 in the finals. Congratulations to Mark and Chris! Justin Bigsby teamed up with Cassie Krause in the Mixed Open Doubles, They defeated Jacqueline Baude and Joseph Wier 1-6, 6-2, 7-6(3), then lost to the No. 2 seeds, Ron Betts and Kim Miksich 6-3, 3-6, 6-3 in the semifinals. Brian Mark and Dana Mark also played in the Men’s 4.0 doubles. They lost in the first round to Jay Bernal and Eric Mooss 6-3, 6-3.